One of the best, modern tooth replacements available are dental implants. They are replacement teeth that replace the whole tooth from root to crown. 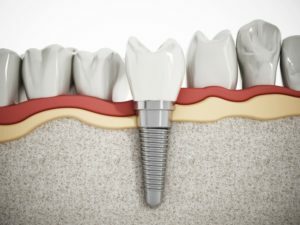 Meaning, the implant post is surgically placed into the jaw and then the visible part of your tooth is replaced with your dental prosthetic of choice. A great candidate for dental implants will have healthy gums because your gums are the foundation to keep your new tooth replacement in place. A good candidate for dental implants will have superb jawbone strength.This is very important as the strength of the jaw is what will keep your implant post in place. Without adequate density, the implant may become loose and fail overtime. Viable dental implant candidates will be committed to great oral health, even quitting tobacco use if they are current smokers. Why Does Your Dentist Advise That You Stop Smoking? Tobacco is one of the main reasons that dental implants fail after they have been placed. How come? Regular smokers—or even patients who chew tobacco—have much higher chances of developing gum disease and losing their teeth. Plus, the chemicals that are found in tobacco products can cause infections to your dental implant site. In order to have a truly healthy smile, your dentist will recommend stopping your tobacco habit altogether. It will be a smart decision for both your oral health and overall health! Nothing is more frustrating or disappointing than having a dental implant failure. That’s why your local dentist will evaluate your current oral health to determine if you’re a good candidate for this type of restoration. If not, they can work one on one with you to help improve your dental health or explore other restorative options with you. Here at Peery Family Dentistry, we want to make replacing your teeth a one-time procedure, meaning that you must care for your replacement teeth as best as you can as well as your oral health. Quitting smoking and other bad habits can help you to effectively replace teeth and keep them for years to come. We recommend scheduling a consultation to discuss implants with our expert dentists to start! Give us a call today to schedule your appointment.